We are constantly working to improve Valley of the Moon. If you are interested in helping with any of these projects please donate, visit the volunteer page or contact us. Rabbit Hole Repair-- The Rabbit Hole has developed a crack which presents a safety issue. We are consulting professionals and accepting donations for the repair. Enchanted Garden Repairs-- Repairs were made in 2017 by volunteers to the leaking pond and trees with roots threatening the stability of the historic walls were removed. Unfortunately, many plants were lost in this process. Dr Helen Erickson provided suggestions to bring the feeling of this historic landscape back and we are on our way to bringing the garden back. Work is continuing to reinforce the outer walls, repair a significant crack in the lower wall and repair the window. Historic Preservation Condition Assessment Update​-- Ten years ago a condition report was done to detail and prioritize work needed to preserve and protect the historic fabric of Valley of the Moon. Our Preservation Team Leader David Yubeta is working to evaluate the current condition of our historic features to provide a plan for future stabilization and repairs. We are extremely fortunate to have a preservationist with David's skills to accomplish this huge task without contracting outside professionals. Major support for this project was provided by Selika Family Services, Inc; Associated Foundations, Inc; Tucson Historic Preservation Foundation and Hamstra Heating, supplemented by savings from ticket sales and donation box contributions. Additionally board members and volunteers provided free or discounted labor and financial gifts. Clean, well maintained bathrooms may not be glamorous but they are important! Volunteer Brett Koehler designed and implemented a much needed remodel of our bathrooms. He obtained a donation of beautiful tile and other materials from Arizona Tile to replace our well-worn bathroom floors. Pavers donated by Marilyn Cleaver improved the ease of approaching the restrooms in a wheelchair. Brett recruited Howard Koehler and Rob Robbins to help with the labor, Fresh paint and repair of doors finished the project. Once the plants were established, Rob Robbins used Catalina rock donated by Churchman's Sand and Gravel to create charming garden rock walls with the help of Brett Koehler, resulting in today's beautiful butterfly garden. 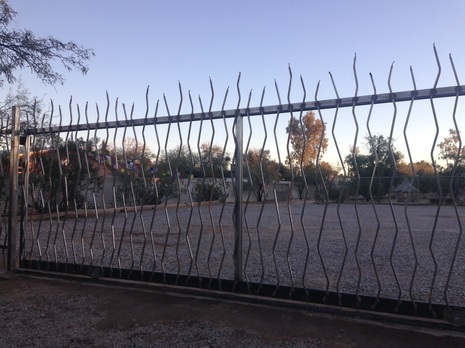 Shari Murphy, volunteer since 1982, donated a significant portion of the money need to to take down and replace the old chain link and barbed wire front fence. This front fence is a beautiful improvement to the Allen Road streetscape. Thanks to the Tucson Historic Preservation Foundation, the support of our community, and the hard work of the Board of Directors, Valley of the Moon was declared a Tucson Historic Landmark by unanimous decision of the Mayor and Council. 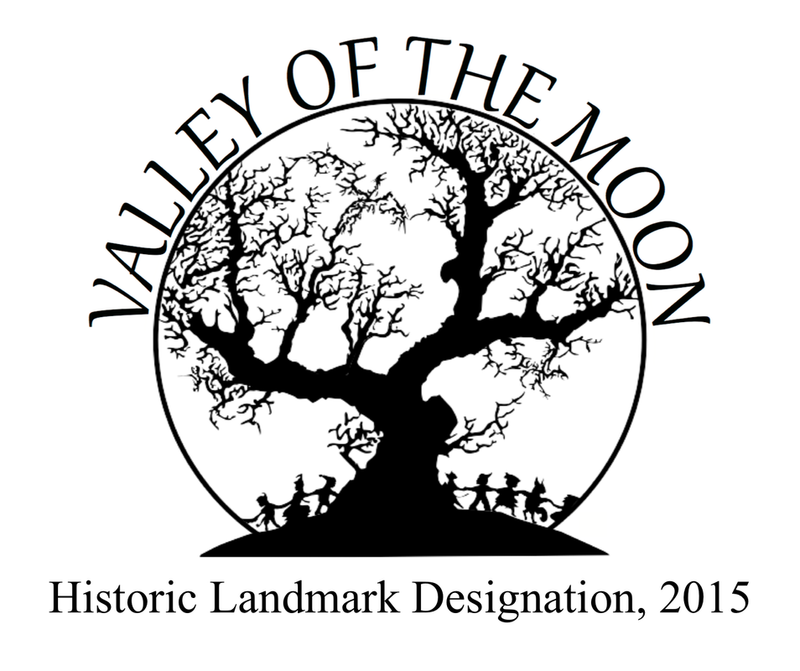 The Historic Landmark designation protects Valley of the Moon from development through a voluntary down-zoning. With this protection in place, the support of our visitors, and continuing volunteerism Valley of the Moon will be around to enchant our grandchildren's grandchildren. Our old light was an inefficient 500 watt halogen that threw light in all directions (including in a couple of neighbors' yards). The new fixture uses two 39 watt LED flood lights and puts the light exactly where it is needed: on the ground in the parking lot. Rob Crosland, Will McConaughy, and other Volunteers. Since its inception Valley of the Moon has had a mission of mental and spiritual health but due to the loose and sandy paths this magical place was effectively off-limits to those people with mobility impairments. We installed two van-accessible parking spaces and 500 linear feet of pathway throughout the North half of the park (including accessing the bathrooms). We are currently planning the final phase of the project which will extend the paths into the historic areas and make Valley of the Moon entirely accessible. We hope you will consider donating to Valley of the Moon to make this second phase possible. Thanks to the dedication and hard work of one volunteer we were able to restore two very visible ponds and a waterfall that haven't been run for over 20 years! These long-dry ponds are again a source of beauty at Valley of the Moon. Thank you to Anthony Johnston for his dedication to this project and seeing it through. These ponds are attracting birds, bobcats, toads, and dragon flies! We scrimped and saved and planned and schemed and finally, with the help of a great bunch of volunteers, accomplished the first half of our electrical replacement project in May of 2014. Good electrical work is invisible, and this electrical work was great! Next time you're at Valley of the Moon and the lights stay on, think of this project! This project was made possible through the accumulated donations of years of visitors, the hard work of a number of volunteers, and the very hard work of Rob Crosland, electrician extraordinaire! Thank you to everyone for making this happen.